Would you like to help Boxwood & Brass bring Harmoniemusik to new audiences? Founded in 2013, Boxwood & Brass is dedicated to putting Harmoniemusik at the heart of classical music in the UK. We've come a long way since our first concert in 2013, and no matter how big the venue, we’re always delighted to see the familiar faces of the friends we’ve gathered along the way. 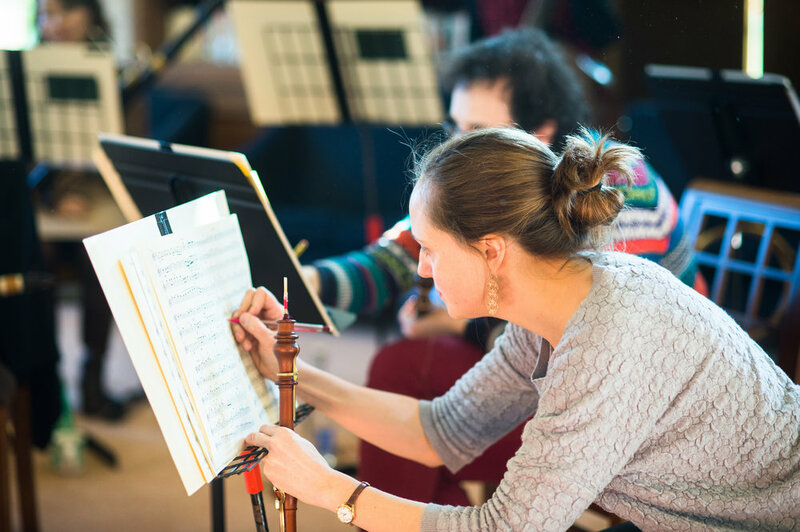 We want to secure a long-term future for the ensemble, so that we can keep pushing the boundaries of historical wind instruments and bring the amazing body of Harmoniemusik to a wider audience. The most important way you can help us is by keeping in touch and spreading the word! Your continued engagement gives us the energy to keep going, and you are the best advertisement for our music. Join our mailing list here. As a small organisation with big ambitions, we welcome supporters offering professional services or consultancy relevant to our activities and development plans, and would be happy to discuss an appropriate form of acknowledgement. Contact us here. Until now, the ensemble has relied on the players investing a huge amount of time and money to cover the expenses of running the ensemble, such as of publicity, rehearsal venues, and overheads. As the Boxwood & Brass’s profile grows, so to do these demands, which is why we’re launching a supporters’ scheme to help us build a more secure financial base for the ensemble. Money raised through donations will help us reach new people through concerts, talks, recordings, courses and education projects. We’re planning to register as a charity, which will eventually allow us to claim Gift Aid on donations. We’d also like to take on an administrator to help us with all of our development plans, so that we can concentrate on the music-making. With your help, we can make these things happen! Our Friends scheme has several options, named after the terms used for music-lovers and musicians in the 18th century. Twice-yearly newsletter. Acknowledgement on our website and priority booking for self-promoted concerts. As Freund und Freundin, plus an invitation to an open rehearsal or development day each year where you can hear what we’re preparing and meet other supporters. As Kenner und Kennerin, plus 2 tickets to one of our self-promoted concerts. Would you like to be more closely involved in our activities? For annual donations of £500 or more you can choose to assign your support to a specific event, such as a commission, a specific concert, or an education project, with prominent acknowledgement in print and online materials. As a Hapsburg Patron, you can choose to sponsor a specific area of our activity. We have some suggestions below, but are also happy to discuss other options. You also get the benefits of a Liebhaber supporter. Updates from your sponsored player after each B&B project, and a 60-minute lesson with your sponsored player for you or a friend. Sponsor one of our new programmes and get regular updates on its development, the opportunity to watch one or more rehearsals, and VIP tickets to one of the performances. If you'd like to join Friends of Harmoniemusik, you can use the PayPal buttons below to pay by card. Use 'Donate' for one-off and annual subscriptions, and 'Subscribe' for monthly payments. Even better, you can make an online payment or monthly standing order direct to our bank account - which means we don't have to pay transaction fees! Click here for our bank details. If you prefer, you can also download this form and send it to us by post with a cheque.